Looking for a healthier alternative to rice as a side dish? 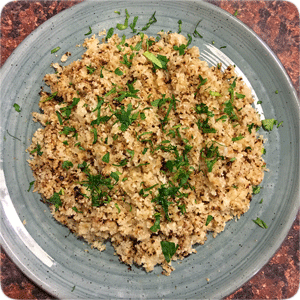 Try this quick and tasty cauliflower rice or couscous recipe while enjoying the anti-inflammatory, antioxidant, and detoxification benefits of cauliflower. 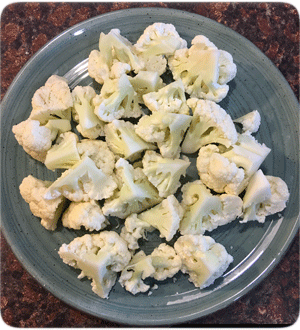 Cut the cauliflower into large pieces: First cut the head of the cauliflower into quarters, then trim out the inner core from each quarter. Break apart the cauliflower into large florets with your hands. If the core is tender, you can chip it into pieces and add it in with the florets. Transfer the cauliflower to a food processor: Don’t fill the food processor more than 3/4 full; if necessary, process it in two batches. Pull out any unprocessed pieces: Some florets or large pieces of cauliflower might remain intact. Pull these out and set them aside. Cooking cauliflower couscous: Cooking makes the cauliflower more tender and rice-like. Warm a tablespoon of olive oil or butter in a large skillet over medium heat. Stir in the couscous and sprinkle with a little salt as well as turmeric if desired. Cover the skillet and cook for 5 to 8 minutes, until the couscous is as tender as you like. Use or serve immediately, or refrigerate the couscous for up to a week. Freezing raw cauliflower couscous: The couscous can also be sealed in airtight containers or bags and frozen for up to three months. Make sure to thaw on the counter for a few minutes before using or cooking. We like to use Cauliflower Rice or Cauliflower Couscous in many ways. I use it as a side dish and add a little Asian flare with pea or pea pods, carrots, scallions (sauté until soft first), etc. Squeeze a little fresh lime juice. I also use it as a replacement in dishes that would normally use rice, like stir fry dishes or shrimp-fried rice dishes, etc.